Cajun music, an emblematic music of Louisiana, is rooted in the ballads of the French-speaking Acadians of Canada. 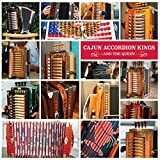 Cajun music is often mentioned in tandem with the Creole-based, Creole-influenced zydeco form, both of Acadiana origin. These French Louisiana sounds have influenced American popular music for many decades, especially country music. Cajun Song : "L'anse aux pailles"